Don't get stuck on the little struggles, the setbacks, or minor failures. Take hold of those and use it for positive. Remember that it is part of the learning process and it is going to refine you in the process to greatness. Figure out the ways to generate your first 100 leads for your business. Create your first sales funnel by determining the key elements that you need to put this together and do it. Move a potential client towards the sale when you have made the connection. 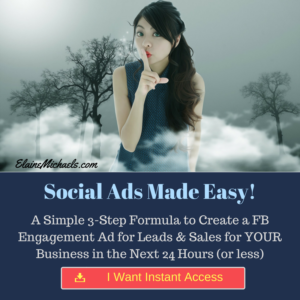 Learn how to create an effective Facebook Ads and use that training to execute. Beef up your daily confidence by feeding your mind with some positive motivational books. You can do this through meditation. Do this first thing in the morning. Let go of all the worry, negative thoughts that hold you down, and be free. Figure out what activity that gives you the most clarity. Have you ever woken up and realized that you have the solution to a problem that you could not figure out the night before? Don't put your cares in the world. We are filled with things that clutter our brain and create idleness and waste our time. When you eliminate the noise, you will see clear steps you need to take and start with the first step. Only do what is essential and stop running down to get the next shiny object. Put on the blinders and execute on the actionables that are going to get you leads and sales. These are the income producing activities. Start or have those conversations. Grabbing this Facebook Ads Training before you go and create one! Build your blog and grow your audience by starting your own blog (and make it profitable)! Position Yourself like a PRO on Facebook and attract people to you. Tip: Do you want to skip to the end of the long line and get the results that you are looking for in your online business? Learn more. Growing up, we always had copies of Reader's Digest around our home. My favorite section to goto first, was a section called Laughter is the Best Medicine. There was always snippets of funny anecdotes that would give me a good chuckle. Believe it or not, there is a power chemical response going on in our brains, across synapses. We boost endorphins running through our bodies when we laugh. Keeping a positive mind is important to protect against negative thoughts or comments from other people that may knock your confidence. Positive energy is also contagious. Not only within our minds but our surroundings. Staying in a positive environment is 3x more effective and productive than in a negative mindset. Laugh at the setbacks and know that it's just a moment, it will pass, and you will only be better for it. Practicing Gratitude is often talked about. This means speaking words of gratituide for all the little things each and every. Write them down in a journal, put them by your bedside, and go through them first thing after you wake up in the morning. Practice means something that is continuously performed on a daily basis. A world renown pianist who debuts at Carnegie Hall does not practice ONLY when it is convenient. That pianist practices everyday for hours at a time and with intention. It was the act of constantly returning to the piano bench over years that brought her to the debut, not the one or two practices prior to the event. When we put this into our morning routine, and we know the long term benefit from this action, it can easily become a positive habit that sticks. Good habits are a choice and it begins with a cornerstone habit. Read more about this in The Power of Habit by Charles Duhigg. Remember, we all started from the same place. The only difference with successful people is that they strive to be exceptional. Learn the exact skills to become the master in your Online Space and Dominate. Be Exceptional. Apply the most important key positive habits and skyrocket to the stars. Hope you like the tips in my blogpost, please comment and share! If you liked my video, be sure to SUBSCRIBE to my Youtube Channel where I bring you the latest. I double dare you! I love this, gratitude is so important and laughter is always the best medicine! We try to laugh every single day, even the bad ones! This is such a great reminder that a more positive person is a happy person. I definitely try to look at the positive side of things when I can. This is such a motivational post! 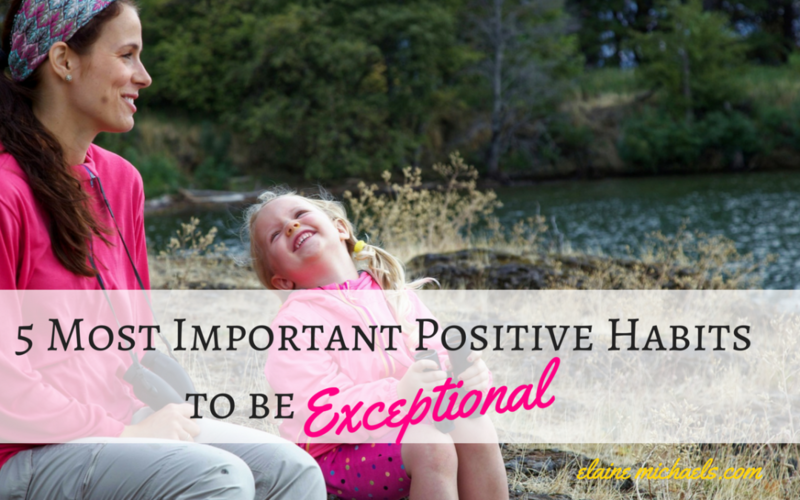 I love the thinking behind these titles and I agree that positivity is key. Laughing often and practicing gratitude are the ones I try to take away every day if I can. You have to be present to do that. This was such a lovely read,I agree with everything you said. since I go to bed with a grateful heart my life is so much better ! Another brilliant post, Elaine. And I absolutely needed this today. It’s been a very frustrating day, so this is just what was needed to get me smiling and on the straight and narrow. Thank you! These are all really great tips for positive habits. I think that when we start to feel gratitude towards everyday life and things we have in our life – such as our family – we often start being very exceptional and happier. Beautiful reminder for all of us to live life on the positive side and it will definitely do wonders. It’s good to be grateful everyday! What a great post. I agree laughing can be a great medicine. It really can lift your mood having a good laugh and make us happier people. Oh yes! You really hit the nail on the head with these! Relax, breathe, and ignore the noise is what I always think when I hit a road block. And laughter is definitely the best medicine! I love the tips here. I need to laugh more often. Laughter is the best medicine for sure. Being positive is sooo crucial, but it can be so hard sometimes. This is helpful! It can definitely be so hard! But when see it can have a cascade effect starting from a small thought in our mind, it is achievable! I love reading your post and playing your video. The positivity really flows. I would like to congratulate you for posting these articles they are empowering and inspiring. Eliza, I didn’t realize how important this was until I started putting into my daily practice. 🙂 I’m so glad it was helpful!